Tonight is the first night of a new round of scrapbook club, and this is the sample layout I have created. Club members can copy this, tweak it or change it to meet their needs. It is interesting to see the starting point and see how individual everyone's pages ends up. Though it was not my intention when I started, it looks like this owl from stamp club. I wanted to create a page with Fall colors, but I think it's the chevron pattern on that sheet of Greenhouse Gala Designer Series Paper that I am drawn to. 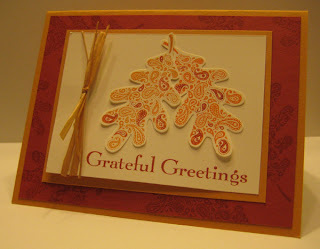 I used one of the punches from the Itty Bitty Shapes punch pack to create the faux brads. 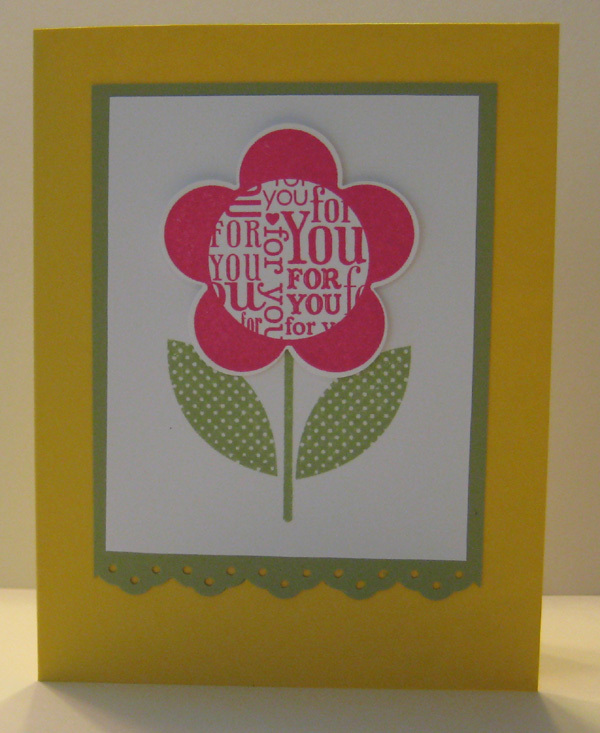 Here's another stamp club projects from last week. I told the ladies to not be surprised if they see this Medallion stamp one more time. My sister has been nice enough to loan it to me so I am using the heck out of it while I have it. I initially borrowed it to do this technique I saw at convention. 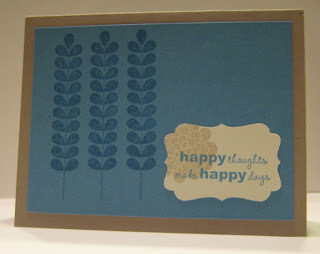 But now, there are lots of other options for us, including this emboss resist with Designer Series Paper. We stamped the Medallion with VersaMark directly on a piece of Sunny Garden Designer Series Paper. Sprinkle with Clear Embossing Powder and heat emboss. We then used a brayer to roll over the image with Poppy Parade. 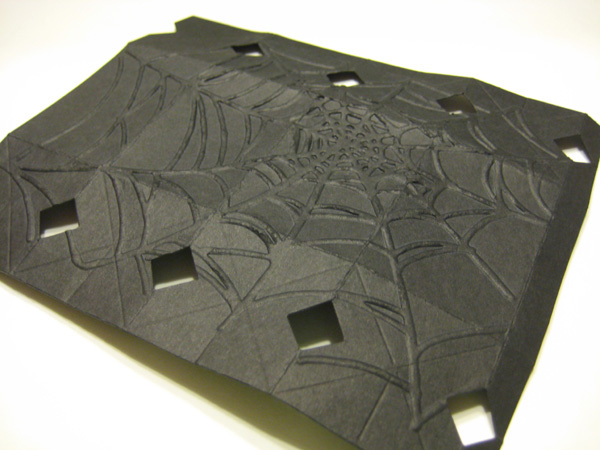 Gently wipe a tissue over the image to remove the ink from the embossed area. 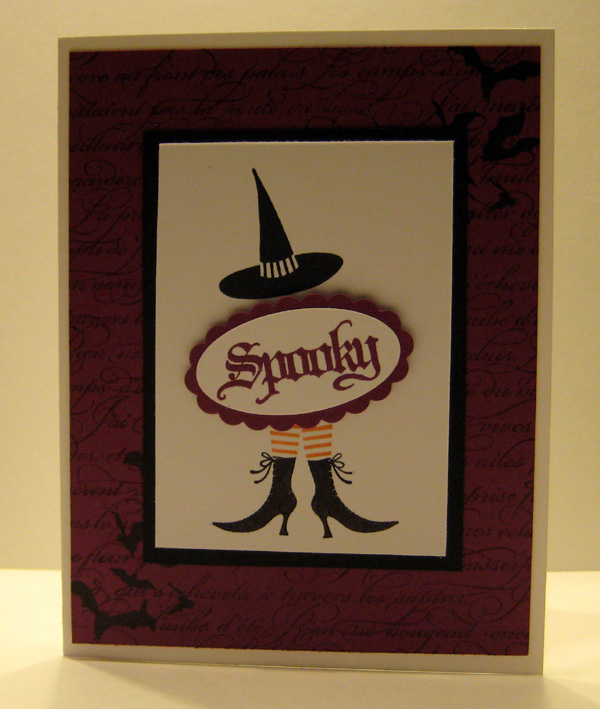 This is a quick 4 x 4 card we did in stamp club this week. 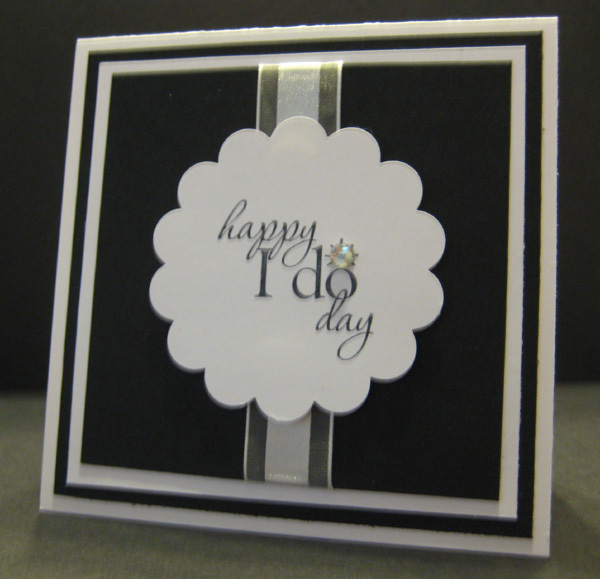 I wanted everyone to have a chance to use the Basic Rhinestones (#119246, $4.95). 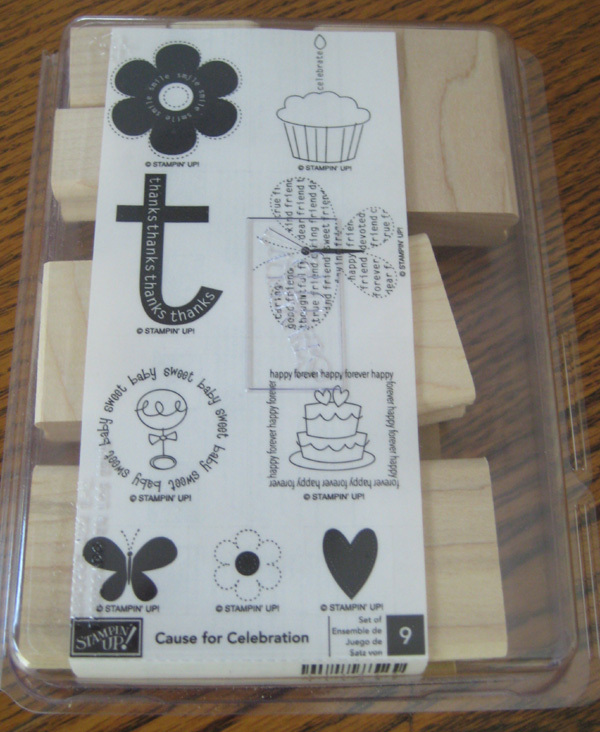 They come in 3 sizes and are perfect for this stamp from the Word Play stamp set. The photo makes it look more like a pearl, but trust me, it's the biggest of the three rhinestones :-) I went with black and white, but imagine customizing and matching the wedding colors. 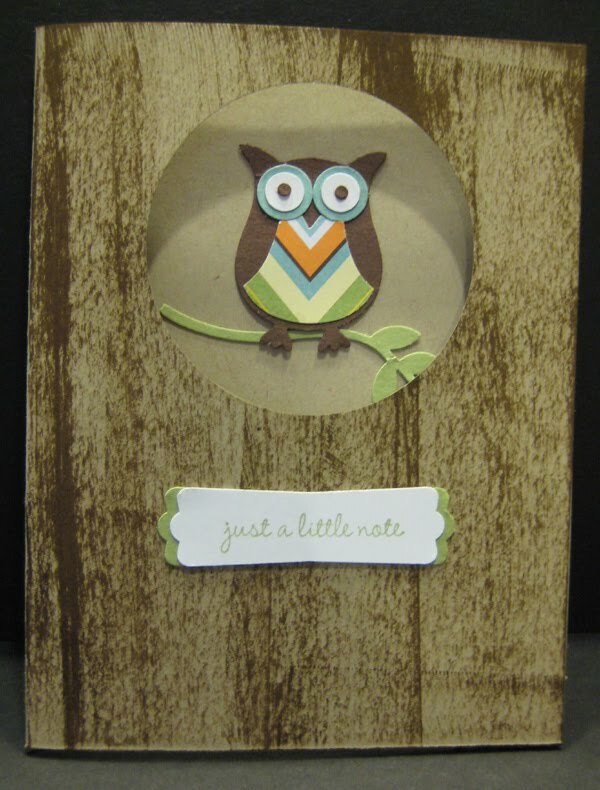 Whoo Whoo Needs a Background Stamp? This is one of our stamp club projects tonight. After resisting the owl punch when the catalog came out, I finally broke down and bought it. I loved all the cute cards I was seeing with non-traditional color combinations and especially like seeing Designer Series Papers used with it. I don't have that fabulous woodgrain background stamp so I just ran my Soft Suede stamp pad up and down a piece of Crumb Cake to create a faux woodgrain. 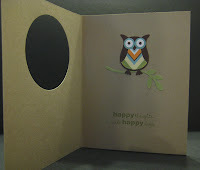 Then with the new extra-large 2 1/2 inch circle punch, I made a hole in my "tree" and perched my owl on a branch from the Two-Step Bird punch. Congratulations to Yvonne for winning my first blog candy! Her comment on this post was "Love the Santa ~~ oh the possibilities !!" It's always fun to sign in and see a comment - thanks to all of you for reading my blog. I'm looking forward to offering blog candy again soon :-) And Yvonne can be looking forward to a new stamp set! I used the new Candy Wrapper Bigz L Die and Spider Web Impressions Embossing Folder to make this quick little treat box. I usually give my second graders pencils and teachery gifts for Halloween, but this is pretty tempting for this stamping teacher! Maybe I will just have to make a few for my special trick-or-treaters. 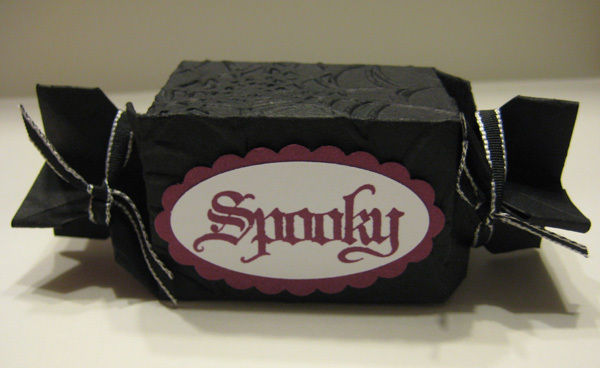 This box twists up and actually does stay by itself, but I liked the added ribbon with the touch of white along the edge. I have been accused of using ribbon too often by a few of my stamping friends - you know who you are :-) So on this card, I tried to keep it ribbonless and simple. I like the Crumb Cake and Marina Mist together and thought it would be a good combo for a man or woman. I tried it both ways, but I found that I liked the vertical leaves look better. The sentiment has been punched with our new decorative label punch. And with an extra large punch like that, you have room for many different word choices. 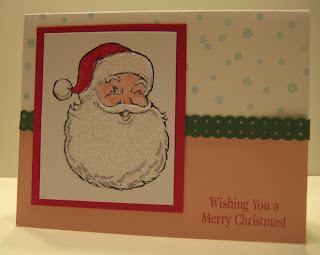 Here is another result of my first card making session with Jolly Old Saint Nick. I just love that Santa face, but the rest of the set is pretty great too! 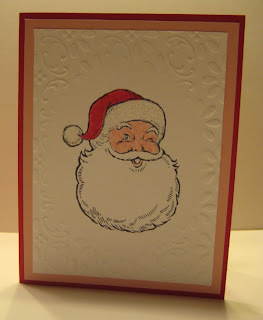 The embossed cardstock was actually a leftover from another project and I thought it might be a cute way to feature Santa. 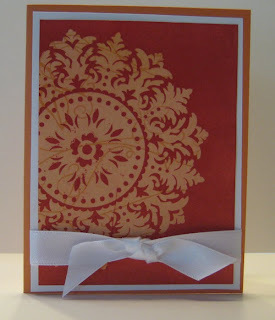 Visit this post if you would like more information on creating that embossed resist oval. The new Holiday Mini Catalog is here and it is loaded with new products! Over the course of the last month, I pre-ordered so many of the new products, I hardly knew where to start. I designed this card for a swap I was in with my absolute favorite set in the catalog, Jolly Old Saint Nick (if I had to pick just one)! If you recieved my newsletter this morning, there was a different version of the same basic card in it. If you don't receive my newsletter and would like to, subscribe in the sidebar at right.